SOUTHINGTON - Watching the Southington football team blow out Glastonbury 41-7 Friday night, the defense looked far from the inexperienced squad it had on paper. Headed into the contest, the Blue Knights had just three players - safety Matt Thompson and defensive linemen John Miller and Ryan Gavronski - who were starters last season. The young team faced a tough test against a Tomahawks offense featuring veterans at nearly every position and Glastonbury looked to exploit that fact with a simple game plan: use the legs of running back Matthew Tenney and quarterback Drew Daniels to spread the field and force the Southington defense to make plays. But the Blue Knights answered the call, holding Glastonbury to just 3.4 yards per carry against the ground-happy Tomahawks. What’s more impressive is that, with the defensive line and linebackers winning their matchups and getting pressure in the backfield, head coach Mike Drury was able to use sets with only five or six players in the box all night long. The longest play of the game for Glastonbury was a 14-yard run from Daniels in the first quarter. In total, Southington allowed just five plays of 10 or more yards. For perspective, the offense hit double-digit yards on plays 13 times in the game. The only score the Blue Knights gave up was after an interception thrown by Southington’s Jacob Drena on the first play of the game and returned to the 30-yard line. Besides that, Southington didn’t allow Glastonbury into the redzone the rest of the game. It also helped the defense played a clean game as well. The Blue Knights committed just two penalties for six yards on defense. Both of those flags came in the first quarter. Essentially, Southington was near-perfect in the final 36 minutes. 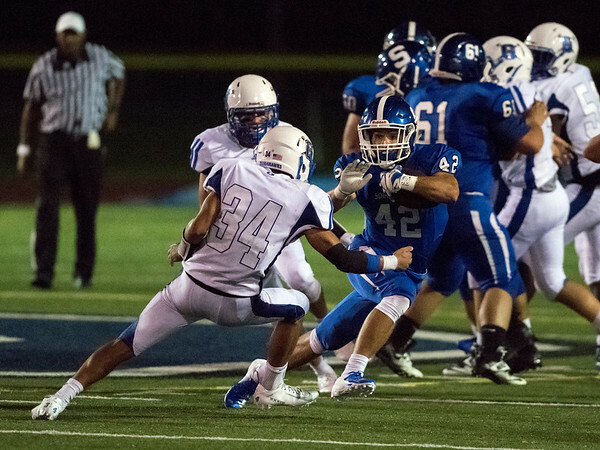 One player who made his presence known for Southington was linebacker Angelo Plantamuro, who in his first varsity start led the team with 15 tackles. But he knew he had to give a great effort and help rally the defense around him, especially with the large amount of new faces on the field. It was hard not to notice the sense of motivation driving the unit. The players want to prove they can be a prolific defense even with so much turnover. The squad seems to rally behind one another in that effort. The test for the defense doesn’t get any easier this week, with trip to Simsbury. Drury knows a team like the Trojans, who can present many different looks, will be a challenge to prepare for. Even still, the defense set the bar high in the opener. As the younger players continue to get more downs under their belts, the unit as a whole could get even better. In other words, it could be a long season for any team that tries to score on the Southington defense this season. Posted in New Britain Herald, Southington on Sunday, 9 September 2018 21:29. Updated: Sunday, 9 September 2018 21:31.